Railpictures.ca - Stephen C. Host Photo: And the second train on a trainless but beautiful Sunday morning, I was fishing for locals in Hamilton since the mainline was so dead and 550 is a guarantee. I arrived *after* 98 to my mistake, but 550 is like shooting fish in a sunny barrel. 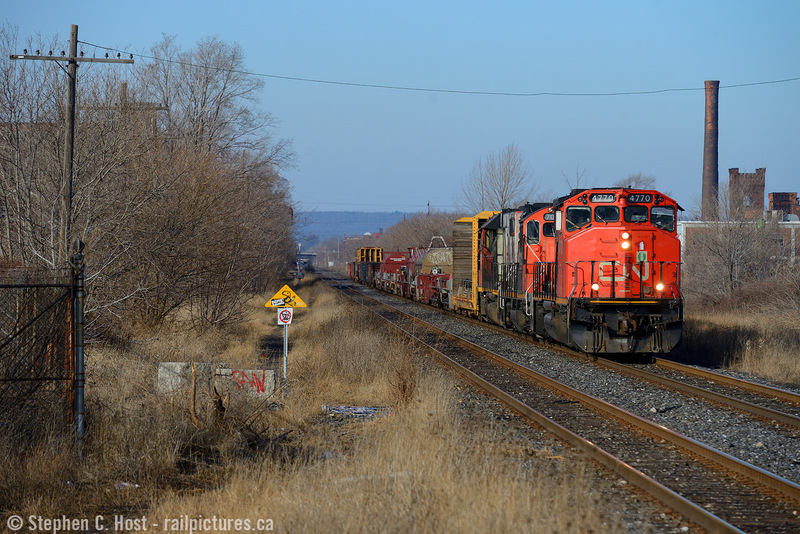 The crew of 550 works Hamilton Yard and Cargoflo almost without fail, then heads down the Grimsby to work any customers needing a switch between Hamilton and Nelles Rd – today they had a D3R load out of GE in Winona before working Parkdale Yard (Steel Centre) and heading back to Aldershot around the noon hour. In this photo, after working Hamilton yard and zig-zagging from the hot track to the north the boys are enroute to Winona to work. I did not follow, as I had something else en-route, the SOR called DS for a light down into “the hole” so I scurried to the N&NW spur to set up for a photo. | Railpictures.ca – Canadian Railway Photography – photographie ferroviaire Canadienne. Caption: And the second train on a trainless but beautiful Sunday morning, I was fishing for locals in Hamilton since the mainline was so dead and 550 is a guarantee. I arrived *after* 98 to my mistake, but 550 is like shooting fish in a sunny barrel. The crew of 550 works Hamilton Yard and Cargoflo almost without fail, then heads down the Grimsby to work any customers needing a switch between Hamilton and Nelles Rd - today they had a D3R load out of GE in Winona before working Parkdale Yard (Steel Centre) and heading back to Aldershot around the noon hour. In this photo, after working Hamilton yard and zig-zagging from the hot track to the north the boys are enroute to Winona to work. I did not follow, as I had something else en-route, the SOR called DS for a light down into "the hole" so I scurried to the N&NW spur to set up for a photo.